Secretary-General Hammarskjöld (right, foreground) is seen as he inspected a Guard of Honor at Njili Airport shortly after his arrival. 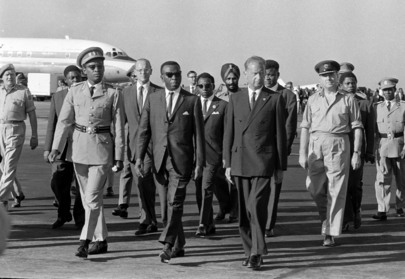 At centre is Prime Minister Cyrille Adoula and, at left, Joseph Mobutu, General of the Armie Nationale Congolaise. On the Secretary-General's left is Gen. S. McKeown, Commander of the United Nations Force in the Congo. The Secretary-General will meet with Premiere Cyrillo Adoula to discuss United Nations aid and support to the Democratic Republic of the Congo .